This World Breastfeeding Week you can take a stand to create a world where every mom who chooses to breastfeed receives the support she needs. From August 1-7, people around the world are celebrating the amazing power of breastfeeding – which reduces illness, saves lives, increases IQ scores, leads to lower health care costs, and so much more! In short, there’s A LOT to celebrate! But what’s the one thing we are NOT celebrating this World Breastfeeding Week? The devastating lack of support for breastfeeding women. No country around the world offers moms the support they need to reach their breastfeeding goals, according to a new global report released this week by UNICEF and the World Health Organization. Millions of mothers want to breastfeed but don’t have the support they need. And as a result, 820,000 children die each year. Without adequate financial, educational, physical, emotional and medical support, there are simply too many barriers for women. Missing work means missing paychecks. Lack of lactation consultants leads to unsuccessful latches. And poor community and family support often leads to turning to infant formula instead of sticking to breastfeeding. Each year more babies die because they are malnourished, and poor countries get poorer because their children aren’t given an adequate chance to thrive. The costs of not breastfeeding are too high, especially for low- to moderate-income countries. It’s time world leaders look at the numbers and understand how something as simple and as natural as breastfeeding could truly strengthen a nation’s place in the world. Supporting “liquid gold” is quite cost-effective. It is estimated that if countries invested just $4.70 per child in breastfeeding support, we could save the lives of more than half a million children! And every dollar spent would bring a $35 dollar return on investment. So what are we waiting for? 1,000 Days is the leading organization fighting in the U.S. and around the world to improve nutrition for women and their babies during the critical window from pregnancy through age two. This World Breastfeeding Week you can take a stand to create a world where every mom who chooses to breastfeed receives the support she needs. 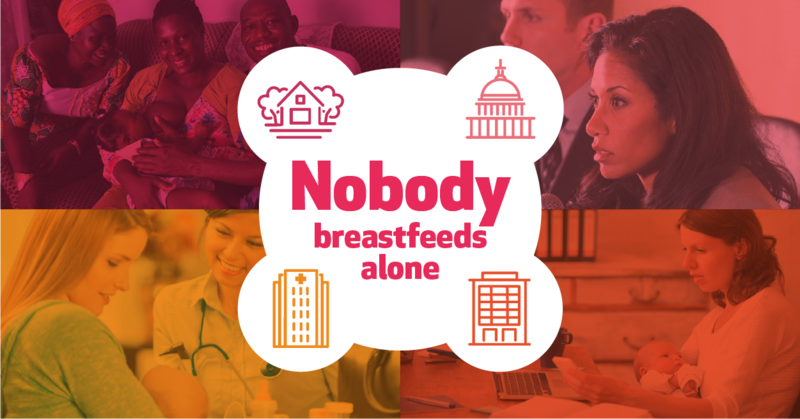 Sign 1,000 Days’ No One Breastfeeds Alone Petition and tell Congress that the U.S. needs to step up its breastfeeding game with the appropriate laws and programs that support all moms- in the U.S. and around the world- to breastfeed. Add a Facebook Profile Frame and show your friends and family that no one breastfeeds alone. Andrea Beegle is the Director of Strategic Partnerships at 1,000 Days. She loves snuggling with her 1 year old daughter and her passion is to connect people to the world’s most pressing issues in fun and impactful ways. Andrea Beegle is the Director of Strategic Partnerships at 1,000 Days. She loves snuggling with her 1 year old daughter and her passion is to connect people to the world’s most pressing issues in fun and impactful ways.